ASAP Systems, the leader in inventory system and asset tracking solutions, adapts the RFID technology in its cloud-based asset tracking system, BarCloud. 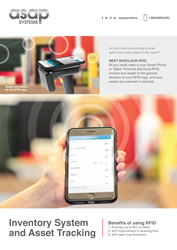 With ASAP Systems’ new integration of RFID technology, companies can perform their detailed, accurate inventory of fixed assets in a 90 percent faster way than single-handedly scanning barcodes. Additionally, labor costs are reduced by 40 percent, and the accuracy increases up to 95 percent! ASAP Systems’ BarCloud is used as a mobile application, adaptable to both iPhones and Android. By using only the tracking device and a smartphone, companies can perform their physical inventories in 1/10 of the time they were taking before using BarCloud. In up to 5 seconds, they can generate an on-site discrepancy report where they can compare the current inventory to the previous one. This strategy allows staff to quickly identify missing items. Therefore regular asset tracking procedures keep track of asset losses, hence reducing thefts to up to 70 percent. In up to 5 seconds, companies can gain real-time awareness of the fixed assets. With RFID, companies do not need to scan items individually anymore, so fewer individuals are needed to do asset tracking, hence reducing labor costs by 40 percent or more. Scanning can be done automatically using the tracking device and smartphone until up to 15 meters, with an accuracy of up to 95 percent or more! We solve the biggest problem in inventory management and asset tracking: Everyone does it differently. Through many years of experience working on a vast range of unique customer requirements, we have developed unmatched expertise in catering solutions to fit almost any budget, technical and user requirement. Our highly-configurable and scalable barcode and RFID based tracking systems are designed to provide maximum ROI today, tomorrow, and into the future. Offices in San Jose, California (headquarters) and Austin, Texas.